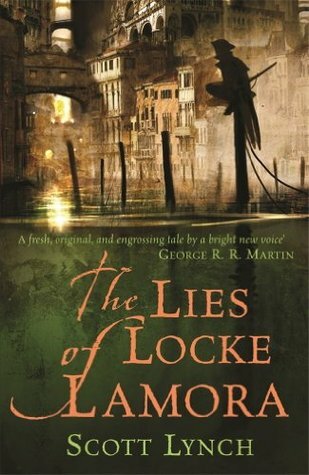 Scott Lynch’s fantasy novel „The Lies of Locke Lamora“ is one of the few novels into which I’ve dived completely blind and without knowing anything that reached beyond the look of the book cover. Since I’m (still) not really an avid fantasy reader I was also quite intimidated by the almost 600 pages of this novel but decided to give it a try, mainly because some of my trusted bookish friends highly recommended it to me. And I won’t deny that I was having a bit of a hard time finding my way into the story because especially in the first half of the book Lynch jumps back and forth in time A LOT. The main storyline is focused on Locke Lamora’s adult life as the „Thorn of Camorr“, the most infamous thief of a gang called „The Gentleman Bastards“. Growing up together in the streets of Camorr Locke and his friends were raised to become some of the the best-trained tricksters and con men Camorr has ever seen and at the beginning of the story they’re in the middle of planning their masterpiece, cheating the noble Don Salvara and his wife out of the biggest amount of money they have ever heisted. The many flashbacks on the other hand tell the reader how the young Locke became a part of the gang and how he received his criminal education that one day would make him a legend among the people of Camorr. This alone didn’t confuse me but the first 100-150 pages of the book mostly consist of little anecdotes from Locke’s childhood and it takes quite a while for the story to develop a consistent storyline. While I had some trouble finding into the story I almost immediately felt like I had arrived in the SETTING. As I mentioned above I can’t claim to have experienced a lot of fantastical worlds since the genre is a bit off my beaten path, but the city of Camorr is nonetheless one of my favorite settings EVER. Scott Lynch’s worldbuilding is absolutely incredible and it’s amazing how complex the Camorr universe is, even though the story basically just takes place in one city and you almost get no information about what the world outside of Camorr looks like. Before you can even find out about the social structures the first thing that totally got me was the outward appearance of Camorr which in general looks a bit like a medieval version of Venice with many narrow streets that are surrounded by water. But the city also has a glorious past and even though the mysterious Eldren, the founders of Camorr, have long ago left the city, you can still see their work on every corner since huge parts of Camorr were build with Elderglass, a magical and indestructible material that gives this place a very impressive look – of course it’s all just in your head but Lynch’s descriptions are so visual and fascinating that it feels as if you yourself would be strolling through the streets in the night and see the luminescent glow of the Elderglass. It even gets better because the more you learn about life in Camorr the more real it becomes in your imagination and it’s highly interesting to learn about how society works or about the unique customs and traditions of the city – and there’s always still more to discover. And after I had survived the challenging first chapters of the book I began to love the story as well. I don’t really want to tell too much about the actual plot because it would ruin a lot of surprises but „The Lies of Locke Lamora“ was SO much better than I had expected because it had EVERYTHING: It starts out as lot of fun and feels a bit like an „Ocean’s Eleven“ story set in medieval Venice and I absolutely LOVED to read about all those little cons and thefts of the Gentleman Bastards, even if they were about such simple things as trying to steal a fine suit to be able to blend in with the higher circles of the Camorr society. It was also amazing to see how the characters acted together, how they worked out their mischievous plans and eventually put them into action and even though the Bastards are technically a bunch of criminals you can’t just not sympathize with them because they still have a high moral code, are incredibly loyal to each other and don’t take from the poor. And even though they are always aiming for their next successful heist you never get the impression that they’re greedy and doing it all for the money but rather that Locke and his thief friends just really enjoy the challenge. But don’t allow yourself to be lulled into a false sense of security by all the hilarious frauds and fascinating thefts because just when you feel like „The Lies of Locke Lamora“ is „just“ a highly entertaining gangster comedy Scott Lynch punches you right in the gut and rips your heart out and even though this book can be pretty painful it is those dark episodes that take the novel to a whole new level and I have to admit that I enjoyed the cruel (and also quite brutal) parts maybe even more (what a surprise, haha). Hadn’t I struggled a bit with the beginning Scott Lynch’s first book in the Gentleman Bastards series would have been a perfect novel but it’s still one of the best books I’ve read in the past years. 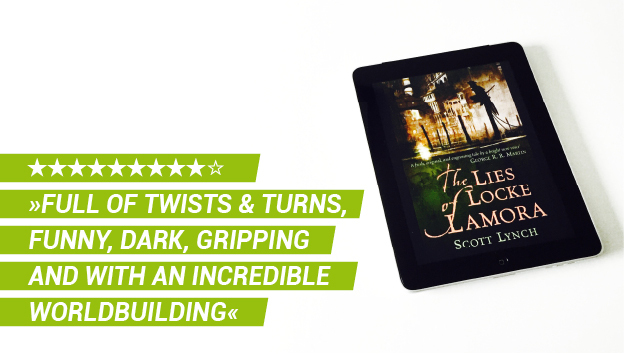 The plot is full of twists and turns, the characters are great, the thefts are hilarious and fascinating and the worldbuilding was incredible – I was actually really sad when this story was over and I had to leave the amazing city of Camorr and return to reality. Scott Lynch's first Gentleman Bastards adventure is a fantasy novel close to perfection: The plot is full of twists and turns, the characters are great, the thefts are hilarious and fascinating and the incredible worldbuilding lets you experience Locke Lamora's world as if you yourself were a part of his gang of thieves and would stroll the streets of the many-faceted city of Camorr. No idea where I will ever find the time for all the series that I have started, but this review says, I have to read this book! I can’t believe you remembered enough to write a review after all these months. XD It makes me want to re-read the book. I was hoping to do that before the fourth one (eventually) comes out, but I’m not sure I can bring myself to read the second and third ones again. I really wish they had the same setting, because it’s impossible to live up to Camorr. This one is really the high point, because the interactions between the characters are awesome, and the heists are exciting. I love rooting for clever thieves! I’m still hoping the upcoming books will take us back to Camorr. I’m really glad you enjoyed Locke’s story. This is one of my favourite series of all time and I’m always trying to make people read it. Yep, the worldbuilding is fantastic. Lynch just pays so much attention to detail – and his writing is so, so good. I love the combination of funny and heartbreaking he managed to string together. I’m currently waiting for The Thorn of Emberlain to be published – keeping my fingers crossed for the summer of 2016. Great review! Thanks! I saw only recently that you’re hosting a read-along for the series, otherwise I would have joined you for book 3! I have to admit that I enjoyed „Red Seas Under Red Skies“ way less than the first one and am a bit afraid that the same applies for the third book since Maraia told me she liked it the least, but I definitely want to read it before book 4 comes out! Mir ging es mit dem Buch sehr ähnlich. Ich habe zwei Anläufe gebraucht, beim ersten mal hatte ich nach einigen Kapiteln abgebrochen. Vor allem der Beginn ist wirklich eine Herausforderung. Aber dann, mein Gott war das Buch gut. Ich kann dir nur zustimmen, nahezu perfekt und deshalb auf Platz 2 meiner Alltime Liste nach „Der Name des Windes“. Jetzt im Sommer kommt ja Buch 4, ich freu mich! Zwar fand ich beide Folgebände leider etwas schwächer, aber die Figuren, das Setting und alles drum und dran sind noch immer 10 mal. besser, als so andere Fantasy Bücher. Ja es ist echt ein wenig schade mit den Fortsetzungen :/ Aber ich glaube, es liegt daran, dass eben Buch 1 dermaßen gut ist, dass es sehr schwer ist daran anzuknüpfen. Ich drücke dir feste die Daumen mit Teil 3! I’m so glad you loved this one! I agree 100%. I listened to the first and second as audiobooks, and I can’t wait for the third. Keep going in the series- the second one has a different setting, but it’s just as powerful, twisty, and unexpected as the first. I already read the second but unfortunately didn’t enjoy as much as the first one. I really missed Camorr!